Fido’s Fences has developed a training routine that is simple and effective in introducing an animal to the system. 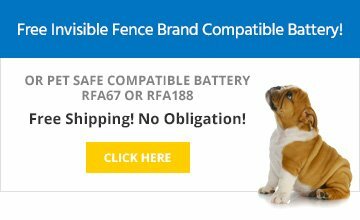 If you elect to have your system installed by our professional staff, our pet consultants will train your pets to recognize their containment area through a combination of voice commands and visual flags that are set inside the electronic fence. With training, the dog and/or cat soon remembers the placement of the flags and is taught to stay within the containment area. During the training period, flags are gradually taken away. If your pet goes to within 5-10 feet of the boundary, he will first hear a warning sound. If the dog reaches the boundary, he will receive a mild correction. Remember that a dog’s attention span will only allow for a training session of about 15 minutes. How can I make training easier on my dog? Thorough training is key to keeping your pet safe and contained. Just as with any new rule or command you introduce to your dog, create the proper environment for a pleasant learning experience. Consistency is the key to successful training, so don’t allow the dog to cross the fence boundary for any reason once you’ve begun training. Keep up with scheduled training sessions until your dog is fully trained. 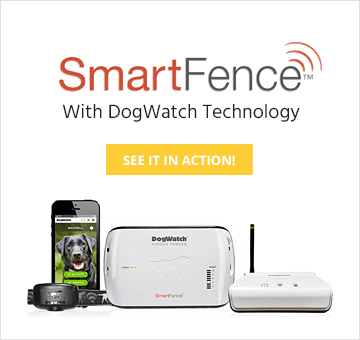 Incorporate distractions such as a neighbor, children, joggers, or dog walkers into the training – after all, you’ll be counting on the fence system to contain your pet even when there’s something interesting passing by! How long until I can leave my dog unattended? It usually takes 4-5 days of training to introduce the system to your dog, but we recommend supervising the dog until you are completely confident he will stay contained. Every dog is different, but as a general rule of thumb, after about 2 weeks of supervision you may start leaving your dog unattended for short intervals. Start with about 15 minutes and gradually increase the time. If you have more than one dog, we recommend that you train them separately. It might take a little more time at the outset but in the long run, it will be a time-saver as each dog will learn much more quickly. My dog seems really nervous about the pet containment system. What should I do? How well your dog will adjust to the system depends on his personality. This is a completely new experience, and it takes some getting used to, and it takes some dogs longer to adjust than others. If your dog is nervous, take more time to train to make sure he adjusts well to the system. This means more days of training, with a much shorter period of fence training accompanied by a longer period of play time (on a leash) in the permitted area. It is just as important to teach the dog where he can safely go and play as it is to teach him the limits. Remember that if you’re anxious or worried about relying on the pet containment system, your dog will be anxious too; so if you’re having trouble with the process, consider hiring an experienced professional obedience trainer to get you started. Keep the sessions very positive and give the dog plenty of praise! It’s been a few days since we started training but my dog still won’t leave the house. Now what? Some dogs take a little more time to get used to the new system. Here are a few steps you can take to help him/her be more comfortable. Bring your dog out to the farthest point in the yard from the door, about 10′ inside of the training flags, even if your dog is pulling on the leash and trying hard not to go there. Drop the leash and watch him/her run straight back to the house. Grab him/her and do that again… and again… and again. This may get boring, but repetition is the key. You will soon notice that every time you drop that leash, it’s taking a little longer for your dog to return to the house… and eventually, he’ll probably get distracted by something interesting along the way. Make sure you do this in different places in your yard. The more you do this exercise, the more comfortable he/she will be with the outside boundaries. Bring your dog’s favorite toy outside, and play together. Your dog will feel reassured by your attention and presence, and will learn to move freely within the boundaries. Be careful during this time to keep the dog safely away from the fence boundaries, since an inadvertent correction during playtime will cause your dog more anxiety. Bring your dog’s favorite treat outside. Praise and reward your dog every time he/she moves further from the house (e.g., every 10 feet). Can I take the collar off when my dog is inside? We recommend that you leave the receiver collar on the dog at all times during the day, to ensure that your dog will stay contained in the event of an accidental “escape” into the yard. We do, however, strongly recommend that you remove the collar at night in order to let your dog’s skin breathe and recover from any irritation.